I can't believe it has taken me until now to write this post and share it with you lovely bloggers. Maybe it was the fact that I put the bags away in my closet shortly after I brought them home and then forgot all about them ... but how could I?! ... They were bags full of treasures! I am sure I told you about the 4 week long church sale that happens here in our town. The London Orchestra organises it every year and it is amazing! Every day many, many new things arrived and it was a constant renewal of goodies for sale and it is oh so addicting! I must admit I went there I think 5 or 6 times or maybe more and found many lovely treasures. My most favourite table was the linen table. There was so much beauty in one little space ... how could I resist? ... Well I couldn't and I didn't! But there was so much more ... tarnished pieces, old crocheting yarn and many other bits and bobs ... I was in junker's/horader's heaven! There are many photos to share and because I didn't want to wait any longer to share them with you ... yes, I am impatient at times ... I didn't wash or iron them first. I know, I should really! ... this one is made from silk and embroidered so pretty. 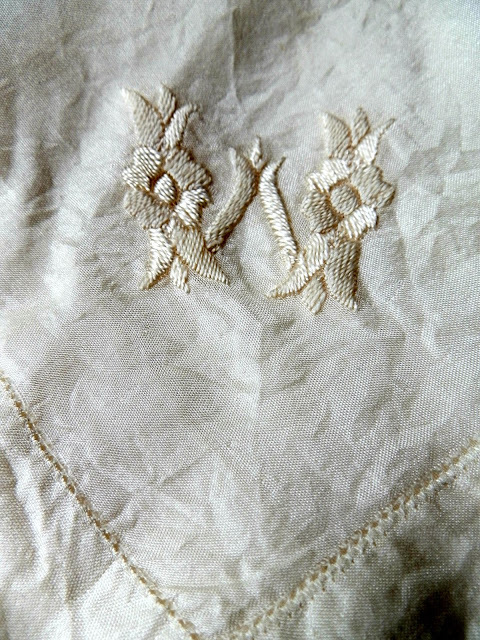 The most beautiful embroidered table linen, some large and some small. ... this lovely embroidered table cloth. I actually thought about buying this beautiful piece every time I went to the church sale and in the end I just had to have it. It is such a stunning piece! The birds ~ which I think are swallows ~ are made from French knots and look wonderful! I am so happy I decided to buy it in the end because not only do I love vintage linen but I also love white on white embroidery. Tomorrow I will share the second part of my treasures that I found at the four week long church sale, so maybe you can stop by and take a look?! Was für wundervolle Tischdecken und Deckchen.... Ich bin gespannt, was du herrliches daraus zaubern wirst! You must have been so excited to find all of these beautiful linens. And look at the detail on the bird! It's exquisite! Enjoy! Such beautiful linens...you've found a treasure trove! Would I love to go to a sale like that!! I love all the beautiful linens, and look forward to part 2 Karen!! Absolutely gorgeous....and so much gorgeousness!!!! I know you will make beautiful things from these! Oh my goodness-- you bought all of that!!!!! You really did find absolute treasures--- so very beautiful!